The Steel Wheels On Mountain Stage The Appalachian quartet brought a rootsy blend of bluegrass, blues and gospel music to West Virginia's most famous stage for its first appearance on the show. 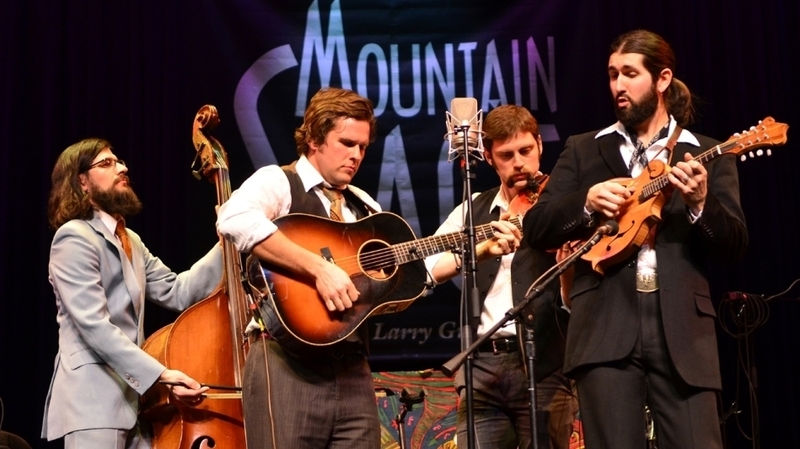 The Steel Wheels performed on Mountain Stage. Harrisonburg, Virginia's The Steel Wheels makes its first appearance on Mountain Stage with songs from the acclaimed album Red Wing. The quartet has built a following through the region's biggest festivals, including Bristol Rhythm & Roots Reunion, Floydfest, Folk Alliance, Appalachian Uprising, and at roots music venue The Purple Fiddle. The Steel Wheels' rootsy blend walks the line between bluegrass, blues and gospel music. Singer, guitarist and principal songwriter Trent Wagler is joined by Jay Lapp on mandolin, Brian Dickel on upright bass and Eric Brubaker on fiddle. All four contribute to the band's stirring vocal harmonies. For the song "Long Way to Go," Lapp trades out his mandolin for an acoustic baritone guitar built by Dickel, an accomplished luthier in his own right. For the closer, "Surround Me," the group puts its instruments aside altogether to deliver a powerful a cappella performance. This segment originally aired on April 13, 2011.